I am currently on Social Security Disability. Almost a year ago, on a doctor’s recommendation and some hope that I would get my life back, I quit my job as a banker, hoping we would make it until I was approved. Going on disability was one of the hardest decisions I’ve ever had to make. 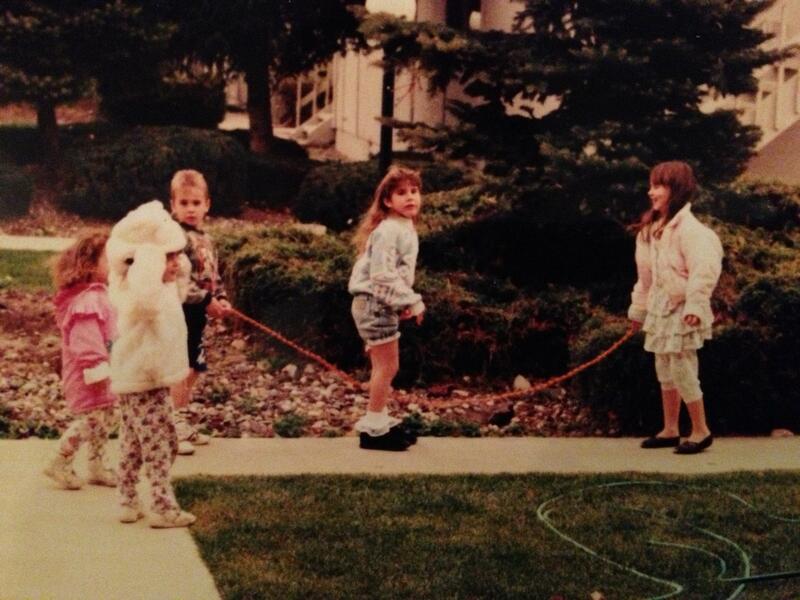 I started babysitting other peoples’ kids when I was 11. I started looking for a job when I was 15. Nobody would hire me until I was 16. I’ve been working ever since. I’d worked in fast food, retail, a gas station, a hotel, and as a bookkeeper. When I landed a job as a banker, I finally felt like I’d found something I wanted to do long term. So when, at 25 years old, I started having trouble just standing at my teller station, I was worried. I loved my job. I learned something new every day. There was always a puzzle to solve or a fire to put out. I loved that I could answer the phone call of an upset customer, and hear them smiling by the time we said goodbye. My boss was amazing. My coworkers were funny, fun to be around, and fun to work with. Most of our customers came in daily, or at least weekly. We knew them well and they were fun to be around too. The future was exciting. The career possibilities were endless. As time went on, standing at the teller station wasn’t the only thing I had trouble with. The distance I could walk grew shorter and shorter. Taking a shower seemed overwhelming. Even getting dressed was difficult. My time away from work was hard too. Getting home, it seemed like the only thing I could do was lay on the couch. On the weekends, when we were supposed to be going to the park or to a friend’s house, we would end up staying home instead because I needed to stay in bed with a heating pad. To make it easier for me to work, my boss gave me her desk next to the teller counter so I could sit and still do my job, while she sat at one across the room. That meant she had to stand at my teller station when we needed extra help. They let me wear tennis shoes, or even flip flops when I couldn’t get shoes on, instead of following the business casual dress code. When I could no longer handle walking through the grocery store, my doctor and physical therapist told me I needed a wheel chair and leg braces. Even using those I was still in constant pain, but finally I was told they couldn’t do anything else for me. Surgery wouldn’t fix this one. The only thing they could do was prescribe pain killers and muscle relaxers to ease the pain. My husband, Sal, and my mom kept telling me I needed to go on disability. The thought of being able to relax when I needed to and not having to put myself in pain working every day – plus being able to stay home with my family – sounded great, but there were too many unknowns. I would have to quit my job just to apply. How would we pay the bills on one income? How long would it take to be approved? How much less would it be than my paycheck? What if I wasn’t approved at all? At the end I was late to work every day because getting ready for work seemed too overwhelming and painful. I had to take breaks between everything. I would cry at work from the pain, and my coworkers would all tell me to go home and rest. A lot of days I would call in because I literally couldn’t get out of bed. I loved my job. To me, quitting my job felt like giving up. Like my handicap won. I’ve never been one to just give up. What would the future look like without my job? I cried for a long time. I prayed for the pain to just go away. I had big dreams when I was little. Still do. But honestly, the most important dream to me was having a family and giving my kids a great childhood. And I wasn’t doing that. I was giving my little bit of energy to my job, only to come home and lay in the fetal position until I got up in the morning and did it all over again. I realized that I did not want to look back on my life and say that all I did was work at the bank. It was a scary decision. It meant an uncertain amount of time on only one income. If I was denied I knew I wouldn’t be able to just go get another job. I would have to keep fighting – without a paycheck – until I was approved. Finally I felt a peace about not working. I started to see the bright side. While it was closing one door, it was opening up a world of others. I would be able to see my husband more than just on the weekends. I would be there when my daughter got home from school, and our time wouldn’t be focused just on dinner, homework, and bedtime. I had just found out I was pregnant. Now I would be able to stay home with the baby. Maybe it would mean I wasn’t in so much pain. I would be able to do all the things I could never find the time for before – music, writing, projects –maybe this wasn’t such a bad thing. Maybe, it’s an opportunity. An opportunity I wouldn’t have if I wasn’t disabled. So with a recommendation from my doctor, I put in my notice. I was sad to go. I would miss the challenge of my job, and I would miss the people. But in a way it was an exciting new adventure. Who knows what the future could bring? It took 5 months to get my case approved. Those 5 months were full of paperwork, interviews, doctor appointments, and anxiety. Being on one income, I would get dirty looks when I pulled out my food assistance card. But it was approved, and it was such a relief. Life is better now. I can rest when I need to rest, and not worry about leaving them short handed at work. I can do much more, and I don’t have to use my wheel chair as much. I haven’t been completely unable to walk since a few weeks after my last day. As a former member of the workforce, I know what it’s like to see the enormous gap between your gross and net pay, and think of how much you could use that money now. I know how it is to feel like you’ve kind of been cheated out of a chunk of your paycheck. I can honestly say I worked as hard as I could for as long as I could. I am thankful that we have programs like Social Security Disability, and other assistance programs that helped us stay afloat while we waited for approval. Remember, while the person in line ahead of you pulling out the food assistance card might be someone who simply chooses to live off of government programs instead of working, the more likely story is that they were or are paying into these programs just like you. That they are doing the best they can. Be thankful that your family is healthy and doing well, and respect the fact that if that ever changes, there are ways to get help, because you, all of us, have helped fund the programs that help people when trouble comes. Don’t you wish you were normal? Yes, people actually ask me this question. Which brings about the ever-popular enigma: What is normal? When I was a kid, my disability didn’t really bother me. I don’t think I really even knew I had one until I started kindergarten and the other kids would ask me why I walked funny. I remember one day coming home from school and trying to watch myself walk in a mirror to figure out what they were talking about. Now, you can judge my family for not having ‘prepared’ me better, but I think the best thing any of them ever did for me was treat me just like any other kid. I think if I had grown up thinking I had all these limitations, I would have been ruled by their imaginary lines. But as far as I was concerned, if Jessica and Michael could do it, I could do it too. And I did. As an adult looking back, I now understand things that I didn’t as a child. Like why nobody else had trouble sitting on the gym floor during assemblies, while I fidgeted the whole time because it hurt my back and I kept falling over. And why it didn’t bother anyone else to stand on bleachers during choir concerts, but I felt like I could take the whole row of kids down at any moment like a game of human dominos. Even as a teen, it never really bothered me. I felt like “Okay, so I limp a little. What’s the big deal?” I remember people at church would pray for me to be healed. I would go along with it. I believe God could heal me in an instant. I never admitted this to them, because it sounds crazy, but I wasn’t so sure I wanted to be healed. I wanted it for other people, so they would believe in God, but I wasn’t sure I wanted it for myself. I was comfortable with what I knew. I kind of believed there was a reason for it. That some good could come from it. It never really bothered me – until it affected my children. Fast forward ten years and I am in constant physical pain. Hour by hour; sometimes not so bad, sometimes horrible, blood-curdling, if-I-wasn’t-in-a-room-full-of-people-I-would-scream pain, but it’s always there. There are numerous things I am not able to do because of it. I don’t sleep well because of it. I have trouble holding my baby. I can’t walk for about an hour in the morning, so if I don’t wake up early enough, my daughter’s on her own for getting ready for school. We’ve had to cancel plans to go to the park or to a birthday party. Some of these things don’t seem like such a big deal, but they are to me. Now let’s look at it from another angle. In January of last year, my uncle was diagnosed with cancer. My uncle is one of the nicest, most caring people I’ve ever known. Not that anyone deserves this kind of thing, but he would have been last on the list. The type of cancer he has is not a type you get from mistreating your body. It just ‘happens’. The day before he was diagnosed, life was going pretty well. He and my aunt had just bought a beautiful house, and their oldest daughter had just married a great guy. Their middle daughter was having an excellent senior year. 24 hours later, he didn’t know if he would get to meet his first grandchild. My aunt didn’t know if the man she had loved her whole life, her best friend, was going to grow old with her as they’d always imagined. My cousin’s didn’t know how much longer they would have with their daddy. Now my problem doesn’t seem so bad, does it? There is more to my uncle’s story, and I know there are countless people in his situation. And countless more in other horrifying situations. I might be stuck on the couch every morning, sometimes all day, but you know something? My husband can bring my son in to me, and my daughter can come in, and we can all sit on the couch and have breakfast together; and I don’t have to wonder if they’ll be here to do it next year. Ok, wipe your tears, because we’re going to back track a little. One day when I was 5 or 6, I came home crying because a kid made fun of me at school. My mom told me something I would never forget. Something that changed the way I saw the world. She told me that everyone has something wrong with them. Something ‘abnormal’ about them. Some things are more obvious, like my cerebral palsy, and some things you couldn’t really see, like her asthma. And she was right. Not only was she right, but it made me feel like a person again. Like the other kids weren’t ‘better’ than me. It also gave me empathy. It made me realize that you can’t know what’s going on with a person just by looking at them. That none of us were ‘normal’. So if none of us are normal… doesn’t that mean we’re all normal? I hate to start my second post on a negative note, but I saw something on Facebook today that really bothered me. Something that one of my friends posted. Something that pretty much sums up why I’m writing this blog. It kind of infuriates me that anyone would think anything beyond ‘Wow, that is a nice car.’ Seriously, like since I’m handicap I can only drive an Impala? 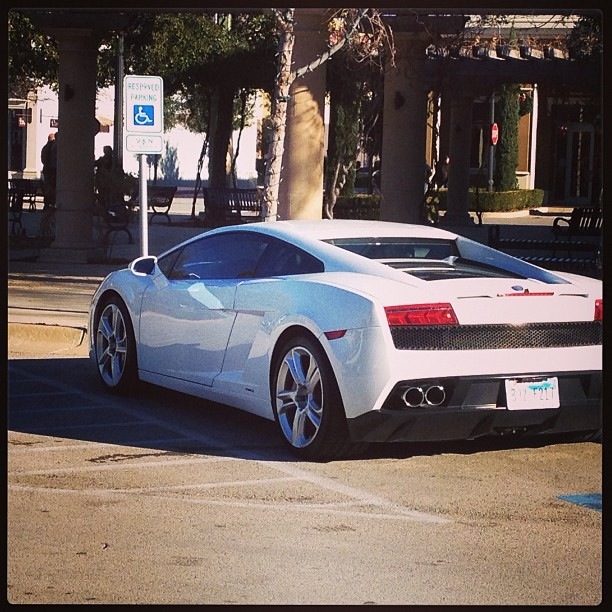 FYI: Having handicap plates does not mean you don’t have a job. It means you’re handicap. The owner of that car could be a successful lawyer or a doctor and have millions. And for those of you assuming that the owner doesn’t have a job and is on Social Security Disability; the amount you are paid monthly from disability is directly related to the amount you paid into it while you were working. So this person could have been a doctor or lawyer, would have paid a bunch into Social Security (automatically deducted as a percentage from your paycheck just like taxes), and then become unable to work. Maybe his grandmother died and he inherited millions. There are a million scenarios in which a handicap person could be the rightful owner of this car, and it’s unfair to think otherwise. I realize it could also be a lazy bum working the system, but why is that the automatic assumption? I know more non-handicap people working the system than I can count on two hands. You know how many handicap people I know who are working the system? Zero. I’ll refer to my friend as AJ. AJ hasn’t commented back on what I said, so I don’t know if he changed his mind, but I hope so. Based on the comments from his other friends, I don’t think they read my comment. I did get a couple ‘Likes’ from mutual friends, so hopefully my words are getting somewhere. AJ, if you read this someday, I hope you know my intention is not to make you feel bad. I realize that you are a good guy who had a lapse in judgment. I know a thing or two about lapses in judgment. My intention is only to change the world’s mind on people who have a disability. One mind at a time. For as long as I can remember, people have asked me what it’s like. What’s it like to limp around on crooked legs? Does it hurt? Don’t I wish I was normal? I was born with Cerebral Palsy. I’ll spare you all of the scientific medical details and tell you that while my mind is fine, I have a lack of control in my muscles, mostly on the left side of my body. I have an obvious limp, which is what attracts most of the stares and questions. I’ve gotten used to the staring. Friends and family (namely my husband) notice it a lot more than I do. When I do notice it I admit I do tense up a bit… which ironically makes the limping worse, but I usually just smile and keep walking. I prefer to use my disability as a good example of sorts, as opposed to turning in to that stereo typical bitter, angry-at-the-world, disabled girl. Don’t get me wrong, I have my bad days. But for the most part I try to inspire; not punish. Let me introduce myself a little better. My name is Ali, I’m 27, and I’m married with two kids, ages 8 years and 5 months. Music is my passion, I’m a little OCD about fitness, and I’m addicted to chocolate. I try (but sometimes fail) to see the bright side of everything, and in spite of my relationship with a loving God Who’s mercies are new every morning, I’m way too hard on myself. That’s just because I’m constantly trying to improve. Some of you are gagging by now I realize, but I’m just trying to give you an honest portrayal. And now for my intentions of this blog. I’m writing this blog to answer the question “What’s it like?”. To hopefully be an inspiration. Even to help myself realize that sometimes it’s okay if when I did such-and-such it didn’t turn out as well as So-and-So’s. I’m not writing this blog to complain, or to throw myself a pity party (though I reserve the right to be upset and vent anonymously on occasion). I honestly believe that my handicap can be a blessing in disguise. I’ve lived it. I also believe there is a reason for everything. There is a purpose for this, even if I can’t see it. And if I’m being completely honest, I’m also writing this blog to try to put an end to some stereotypes and judgements about me and other disabled people. 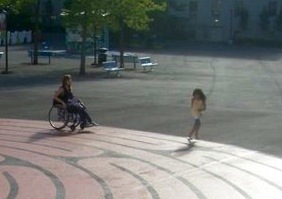 Before you can judge and say what I should do or you would do, you have to go a mile in my wheelchair.